As I sit in this seat of relative wealth and privilege, it is easy to take the comfortable aspects of that seat for granted. It is easy to believe that I know more about someone else’s life than they do themselves. It is easy to believe that I have solutions to another person’s hardship that they themselves cannot see or attain. It is easy to believe that my intention to save another from the challenges they face is genuinely selfless. Beliefs fuel the ideals which inform our choices. But beliefs and ideals that were handed down or picked up during a time of relative innocence or powerlessness result in choices which lead us down an inauthentic path. Regardless of how far we walk down that path, and regardless of our degree of worldly success, enduring fulfillment will continue to elude us and 3 a.m. angst will still threaten to consume us. This lack of fulfillment is a root cause of many global issues including poverty, violence, war, disease, and environmental degradation. When left unchallenged, ideals give rise to individual and collective “comfort zones”. Those comfort zones interfere with our ability to make compassionately responsible choices which further fuels global hardship. As such, it is imperative at this ripe juncture of evolution that we leverage the vast creativity of our prefrontal cortex to illuminate and examine our own conditioned biases. One immediate and effective way we can do that is by challenging elusive comfort zones. This can be easier said than done since our limbic system is hard-wired for self-preservation. Often it takes some combination of deep fear and hope before someone willingly steps outside their comfort zone. But when that fear and hope stem from a hotbed of blind biases, the resulting step will likely do as much harm as it does good. A less common reason people willingly step outside their comfort zone is out of genuine curiosity. 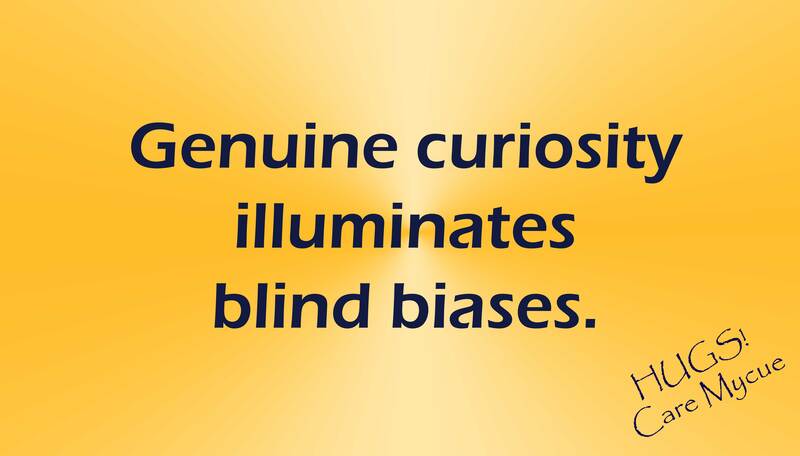 This alternate reason often yields great insights into the true nature of reality, and effectively illuminates blind biases. Raising the curtain on my unseen biases, I become humbled by both my arrogance and my innocence. I am now far less likely to sit in judgement of another or take this seat of relative wealth and privilege for granted. Having endured great challenges, I have come to understand and appreciate the powerful way challenges incinerate false precepts. I am now able to arrive in each situation innocent yet wise. Humble empowerment fosters an authentic path. Bowing to the “unknowns” of a given situation, I embark upon a path of discovery which ultimately reveals new insights about this life that is living me. Revelation is an unending source of fulfillment. Self-fulfilled, my choices now arise from a place of genuine curiosity. Until we have seen clearly our own biases, we would be unwise to assume we know best how to alleviate someone else’s suffering. Until we have seen clearly the gift woven throughout our own struggles, we would be unwise to try and save another from the challenges they face. But when we have seen clearly the global dysfunction spawned by unexamined ideals, we take our first steps on an authentic path of humble empowerment. Only then can we explore from a state of genuine curiosity how to best leverage our seat of relative wealth and privilege in service to another. 1. There are no obstacles: only opportunities to learn and grow. 2. There is nothing I need that I don’t have. 3. Everything that must get done will get done. Some people choose the field of Accounting because of their love of numbers. I had chosen it because of my fear of words. Truth be told, I barely passed 10th grade because of a D- in English. When I was 38, I discovered I was a writer, and my journey since then has been one of trying to reconcile and integrate this “inconvenient truth”. I’m 45 now, and as a single mother with two active girls, a full-time job, physical therapy for a severe herniated disc, and a new consulting business I’m trying to get off the ground, there is little time to just sit and write anymore. And as I found myself torn this morning between wanting to write a post for you today and needing to do therapeutic exercises, get my girls ready for school, and get myself ready for work, I found myself thinking, “I have no time to write today.” There was sadness as that sentiment rolled through me. One lesson I’ve learned well over these past six years is that there are no obstacles: only opportunities to learn and grow. Listening to my inner dialogue this morning I realized I was just making an excuse, and in that excuse, I was turning away from the writer that I am. Two other lessons arrived hot on the heels of this winning truth: there is nothing I need that I don’t have, and everything that must get done will get done. Over the past six years, this trifecta of life lessons has empowered me to transform my life from one of deep despair to one of thriving adventure. When something is important to me, I know I can either make an excuse or I can take action. Granted, there are some fairly immovable factors of my life that I choose to honor in order to keep the wheels greased. But there are many other factors that can shift, shrink, or fall away all together if I am bold enough to be who I am. As I look at my morning from the other side of having written this post, I see clearly that my busy schedule is not what stands in the way of writing: it actually drives me to write. If I had all the time in the world, there is a chance I wouldn’t write much at all, and a chance that the things I would write might be more “soft” and less practical. These very distinct boundaries don’t stand in the way of creativity: they help me get clear quickly about what to write. These boundaries also set the stage for writing and give me material to write about. Even more, they prod me to share what I’ve written before I have a chance to judge it as pure garbage and rework it to death or not post it at all. There are no ostacles: only opportunities to learn and grow. There is nothing I need that I don’t have. Everything that must get done will get done. So now let me ask you: what’s standing in the way of you being most fully yourself? So you want to start a business, but you don’t know which of your many brilliant ideas to commit to. You ask friends, family, successful entrepreneurs, gurus, coaches, and really anyone who will listen (aka: random cashiers who seem genuinely sincere when they ask how your day is going). You run through all your different ideas, weighing the pros and cons of each, hoping that someone will reveal some angle that will tip the scale unquestioningly in favor of one idea over all the rest. To even be contemplating starting a business indicates that you have experienced some degree of mastery with the jobs, projects, and assignments that others have entrusted you with. You have also felt stifled by the lack of opportunity to take that experience to the next level or express your own vision within that environment. Starting a business is your opportunity to take full responsibility for the direction of your life. Only you know which idea you are willing to fully commit to. Relying on other people’s advice is an ill-advised shortcut: then you have them to blame when it fails. Then you are right back where you are right now, faced with the decision of committing your own vision or committing to someone else’s. As long as you are looking to others to choose your path for you, your experience of success as an entrepreneur will be limited. Ideas are not the determinant of success: commitment and persistence are. An entrepreneur who waits for the right idea at the right time for the least money dies without ever starting a business. Ideas are worthless unless you can execute them. Pick one idea that feels achievable, and learn the art of execution. Ideas are harder to execute on than you can even know at this point. Commit to one idea, and learn that lesson. If it were easy and cheap, everyone would be running their own business. You have to be willing to do what 96% of other people wouldn’t do. Clarity and confidence are a result of action, not a prerequisite. True success is an inner phenomenon, not a worldly statistic. If you are unwilling to invest in yourself (even if that means going further into debt), then you are adding significant time to your journey and missing out on unknown opportunities. Money is not an obstacle, it’s an excuse. Time is truly your most precious resource. Get started! More than anything, stop asking “what should I do?” and ask instead “how do I want to be?”, then do that from the time you get up to the time you go to bed. Your need for a the “right answer” is blocking the original insight you need most. Relax, and trust. Realize you are complete even if you can’t completely see all of yourself. When you do that, you will discover the diamond in your pocket. From that space, you cannot fail. How Full Is Your Wheel? I was given a homework assignment this week as part of an inspired business development group I recently joined. 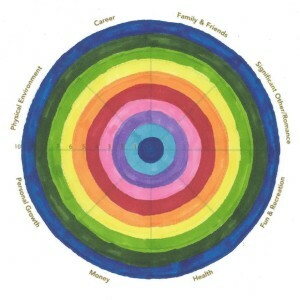 My homework was to fill in a “life wheel”, ranking my degree of fulfillment in eight different key areas of life. At first, I stared blankly at the worksheet and tried to accurately assess each area on a scale of 1 to 10. After several minutes of struggling to even fill in one part of the wheel, I wondered if my inability to gauge my fulfillment was the result of the wheel already being entirely full. I started filling in the wheel to see if that was true, and it turns out it was! All at once I was reminded of the realization I’d had six years ago: that fulfillment is always the case, and that the only thing that shifts is our awareness of it! Now, does that “100% fulfillment” mean I am sitting pretty on a pile of money? No: not in a conventional sense anyway. Would I like that to be the case? Well, that would certainly allow me the opportunity to set up my humanitarian foundation, go all in on my life’s work of helping people take life to the next level, and add to the growing collection of books I’ve authored. And while I love the idea of those possibilities syncing up with my current reality, the fact that that experience is not here now takes nothing away from the degree to which I experience fulfillment. You see, I think differently than most people, but that wasn’t always the case. Like so many people I talk to these days, I used to believe that if I got all the “right pieces” in all the “right places”, I’d be seeped in an experience of enduring fulfillment, and life would be a non-stop bliss picnic. But as good as I was at identifying and achieving my goals, there always seemed to be some area of life that fell short on fulfillment. After almost four decades of trying and failing to create an experience of enduring fulfillment, I was utterly depleted, and in a moment of deep resignation, I gave up my quest. In the days that followed, an innocent curiosity took up residence in the mental/emotional space that had previously been filled with unrelenting angst. In that energetic expanse, I realized the sun never stops shining, which helped me enjoy the rain and no longer fear the dark. I realized the pinnacle nature of this one pristine moment, which put an end to my futile “striving”. More than anything, I realized that the only thing that had interfered with my experience of enduring fulfillment had been my limiting thought process which presumed that fulfillment was something that must be attained. But why then, if I’m so fulfilled, would I still have goals to start foundations and businesses and books? That’s the beautiful part. These inspirations arise as a natural expression of fulfillment rather than as an attempt to attain fulfillment. Because I no longer chase fulfillment or run from fear, I am able to stand clear surveying the expansive horizon. I am able to step in whatever direction feels most aligned with who I know myself to be in this moment, and step towards experiences that will show me ever more deeply to myself. Each step is fueled by fulfillment. Even if at times there is a fleeting experience of uncertainty or disappointment or frustration, those limiting conditioned (and human) experiences arise as a swell on the ocean of fulfillment. There is a coy smile woven throughout each brief heartache: a smile that quickly dispels the illusion of struggle and oppression. I bow to each moment looking for what I may learn, and in doing so, I learn what it is that I have to share and teach others. Even the depth of loneliness, which had persistently threatened to engulf me numerous times throughout my life, has found safe harbor with me. When it knocks at my door, I invite it in for tea and conversation, and listen as it shares the depth of its sorrow. I thank loneliness for serving its purpose so honorably. Before long, loneliness is transformed into radiant warmth as a result of feeling seen, heard, and valued. So how might this insight serve your own quest for fulfillment? Perhaps it will inspire you to rest the quest for fulfillment, and instead simply explore ways to expand awareness of the enduring fulfillment that is already the case. If you’d like some more insights on how to best do that, I’m happy to both share what I know and help guide you to original insights of your own. Recently I took part in my very first group blog interview! The topic was “Productivity”, and I was honestly surprised at how much I had to say on the topic. You can read the interview here, but I also wanted to share some insights that came out of this most recent interview adventure. If you would have asked me twelve months ago whether I felt productive in my everyday life, I would have certainly said an enthusiastic “Yes!” At that time, I was working on my first manuscript, rebuilding my website, blogging, and taking an online course on how to become a successful author. Oh, did I mention I’m a single parent with a full time job?! I was super busy for sure, often working into the early morning hours. I felt great though! Taking a leadership role by directing the course of my life has a fantastic experience, and learning and doing new things makes me come alive! The thing was, I wasn’t seeing a tremendous amount of viable products coming from all my activity, and my manuscript was in danger of missing its deadline. In talking with a friend about my concerns, they pointed me towards a one hour productivity course. I didn’t understand, because in my mind, I was super productive. I trusted their insight, though, so I decided to check it out. What I came to realize from that course is that activity and productivity are two entirely different things! At that time, I was busy, but that busyness wasn’t producing any viable products. As it turns out, the thing my activity was missing was structure, focus, and a measurable outcome. Adding this back in to my life was difficult, because in the five years prior I had transformed my overly analytical and organizational habits in favor of a rich and fulfilling practice of presence awareness. In other words, I was so “here and now” that structuring my activities seemed incongruent with my deepest experience of peace. Happily, I learned I was wrong, and integrating presence awareness with the goals that I have set for my life has taken my experience of peace to the next level! In fact, the resulting insights and experiences were so profound, I decided to start a consulting business helping others do the same in their own lives. How’s that for productive?! Seeing it all in a list here even surprises me. What’s most surprising, though, is that I am actually able to get in my required sleep these days, and my experience of presence awareness has deepened. So if you find you are struggling to turn your dreams into reality and share your life’s work with the world, you may benefit from learning some productivity essentials. I’d love to have a conversation with you about it! In the meantime, you can check out more of my recent productivity insights here. If you have any questions or comments, I’d genuinely love to hear from you! New inspigraphic inspired by my first LinkedIn Post! If we practice resistance, then when we get where we’re going, we will resist there too. An experience of enduring fulfillment becomes possible when we are fundamentally, energetically, exactly where we are. Our thoughts may move in this direction or that, but if our energy is rooted here and now, we can experience our fullest possible expression of ourselves in that moment. That experience is inherently fulfilling. One way of rooting ourselves in the here and now is to remember that we don’t know everything about everything. The only truth worth holding tightly to is the one that says we mustn’t hold too tightly to any given truth. Truth is never what we think it is, yet it can always be experienced here and now within the context of our capacity to understand the situation. With each experience, we understand differently, and so truth must be allowed to shift along with our understanding if we are to gain the full benefit of our experiences. “Yet if my experience is one of resistance, isn’t resistance true then?” To a degree, yes. But you need to ask yourself what is causing the resistance: the situation, or your thoughts about the situation? I can think of few extreme examples of where it might be the situation. More often than not, it is simply our thoughts. Our thoughts about the situation usurp our power by ignoring our role in creating the situation. Only when we take full responsibility for our part in creating the situation, as well as for our thoughts about the situation, can we begin to understand whether the situation even needs changing. Only then are we in a position to make a skilled assessment on how to change it. Otherwise we are simply spinning the roulette wheel again which will likely result in another dead end. Why run that risk, when you can stack the deck in your favor? My new “Fizzle” friend and inspiring blogger, Max Turner, recently wrote a great article about transforming your life simply by learning about the lives of exceptional people. It’s clearly a strategy that has worked wonders for Max, and I couldn’t agree more. For instance, my decision to start my own consulting business seven months ago was the direct result of listening to “everyday” people who are doing exceptional things. I quickly realized that technology has quietly dismantled many “barriers to entry”, and no one had told me! I can now write, publish, and sell a book, and not have to pass through the formidable gatekeepers of publishing. So you know what I did? I published a book! Then another and another. My fourth one will be released later today! But for me, learning about exceptional people will never have as deep or as lasting of an impact on our quest for transformation if we haven’t first experienced our own exceptional lives first hand. Along my journey, I discovered that “wanting” an exceptional experience of life actually interfered with my capacity to experience the exceptional life which was living me. Quite unintentionally, I realized that an exceptional life starts with doing normal things in an exceptional way. My best example: For years I thought that if I could just create a clean and happy home for myself and my family, that we would all be enduringly happy. The problem was, that strategy never seemed to work. We tried moving, buying nicer houses, nicer cars, nicer clothes, nicer vacations: all with no lasting impact to our baseline unhappiness. Eventually I began to deeply resent that I was the one stuck doing all the household chores. It got to the point where I was so transfixed by my unhappiness that there was no room for creativity anymore. Late one night, in a desperate bid for peace, I surrendered all hope of ever creating “happily ever after”. That’s when things got interesting. The next day when I was doing the dishes, it was . . . exceptional. My irreconcilable angst was gone, and in its place was an experience of pristine spaciousness. The smell of the soap, the playful bubbles, the warmth of the water, the concert of sounds, the sun streaming through the window lighting up my face, were all a source of aliveness and fascination. It was a thrilling discovery, and all I could think was: “What else have I been missing all this time?! ?” Since then, I’ve transformed the mundane activities in my everyday life into opportunities for “exceptional”, and in response life has opened up exceptional opportunities for me. Normality is not a malady in need of a cure. When we open to seeing the exceptional in the ordinary, our baseline experience of life is transformed, and we discover new opportunities everywhere. It all begins with you: what normal thing can you open to doing in an exceptional way today? Here’s 10 great pointers to get you started. And when you’re ready for a high-impact approach to get unstuck and on track fast, send me an email: I can definitely help. Unhappiness is a powerful driver of change in our lives. We sense unhappiness, or even simple unrest, and we take action to dispense of whatever we deem the culprit is. This action can seem to alleviate the perception of burden . . . for a time. Eventually that sense of burden is back again, and the cycle begins anew. What if nine-times-out-of-ten the thing that needed changing was not contained within the situation but was instead contained within your thoughts about the situation? How much time, effort, money, and heartache would you save if the only necessary adjustment was simply a shift in perception? What if unhappiness was prompting you to learn something rather than change something? The next time you notice unhappiness, don’t rush off to change what you are doing. Try instead to do what you are doing in a different way. Get curious: what can unhappiness teach us about happiness? Notice one breath consciously, sensing the expansion which that breath fails to relinquish in the face of oppressive unrest. If possible, offer a word of humble gratitude for the situation for prompting you to connect with yourself in a new way. If the desire for change still remains, you are now in a space ripe for effective, compassionate action. Leveraging unhappiness in this way will reveal a creative, inspired, empowered course of action that aligns seamlessly with the intention you hold for your life. Engaging mindfulness helps us clearly identify inconsistencies within our thoughts, speech, feelings and actions. We can then adjust our thought processes as needed to ensure our integrity in intact. Viewing our lives through the lens of mindfulness enables us to recognize which opportunities best support the overarching intention for our lives. Now when we experience resistance to a situation, we are able to most effectively drive change. We accept “what is”, allowing us to first understand whether the issue needing changed is truly in the world or whether it is a result of inconsistencies within our thoughts, speech, feelings, and actions. We then evaluate our intention to ensure that it is both aligned with our values and constructed in a way that sparks curiosity and discovery. Finally we look to see what, if anything, we can do to effect positive change in the situation. If it turns out there is nothing we can do in that moment, mindful acceptance helps us to remain open within the situation. This puts us in a place of empowerment and keeps us open to opportunities for change when they do arise. To read more about mindfulness, check out this series of posts that I wrote. 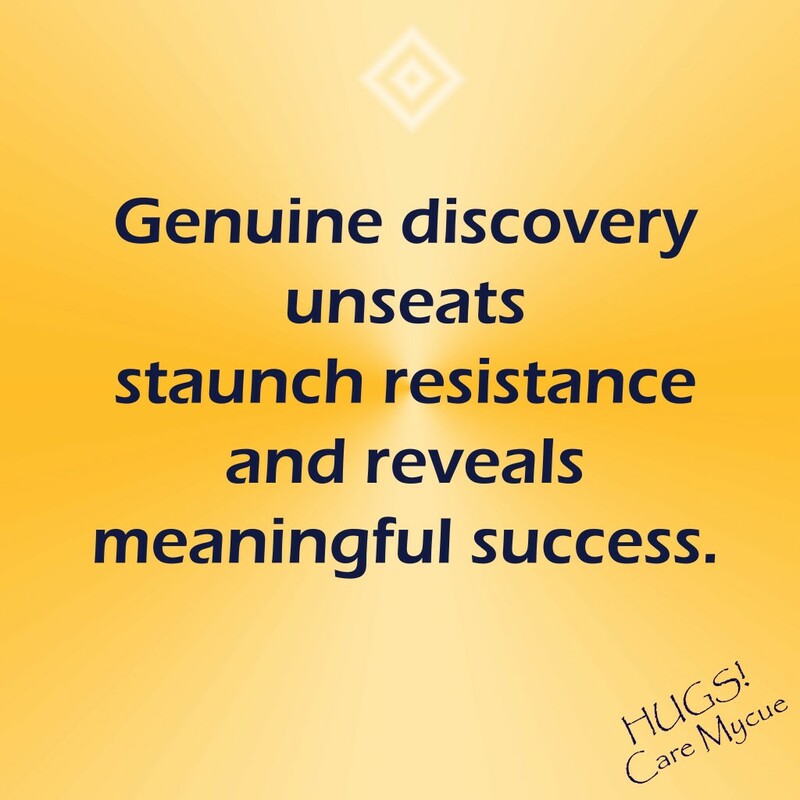 To finally triumph over staunch resistance and get on track towards reaching your goals, email me at care @caremycue.com. Relative independence is something that can potentially be fought for, but relative independence will never fully quench your thirst for freedom. Until you experience fundamental independence, life will seem a worthy adversary and success will seem hard won. At the end of your days however, you will likely realize the battles that consumed your life, the ones you fought hardest for, were but a diversionary ploy. As long as we are fighting those relative fights, we don’t have to face the one that we feel most ill equipped for and most unlikely of winning. We continue to choose the known and comfortable heartache over the daunting and avoidable unknown. We die never having known the rich fullness of life. It is important to realize that the predisposition to settle for less is something that we inherited. Only when we become aware of how judgment defeats us can we even notice the option to make a different choice. Only then can we begin to experience fundamental independence, because the hardest battle was already won the moment our awareness disengaged from relative battles. Only then do we stand clear and drink deeply from our own source, at last quenching our thirst for freedom. This insight is part 1 of 10 in the series "Be"
A common trap we can fall prey to in our everyday lives is the inclination to gloss over the pesky activities that create the foundation of our day. You know, things like brushing our teeth, washing our hands, eating, walking to our car, preparing a meal, cleaning, and whatnot. As with any activity, what we practice we strengthen. Demonstrating a lack of intention with our mundane daily activities can only undermine the degree of intention we bring to other areas of our lives. Despite how many times you may have performed an activity before, these innocuous activities provide a rich opportunity to demonstrate intention. Because they are impersonal, they provide a safe space for us to let our guard down and break free from any judgmental mind chatter. My suggestion: Each morning, call to mind a single simple activity that you do throughout your day. Then, each time that you become aware of doing that activity (before, during, or after), notice one breath consciously. Allow your shoulders to relax, and allow any tension in your face to fall away. Survey your surroundings and activity with a heightened sense of curiosity: What do you smell, feel, hear, that even one moment ago you were entirely unaware of? Slow down, and perform the activity at hand as if you were savoring your most favorite activity. As you finish the activity, perhaps offer a silent word of gratitude. Your experience of life will be well served by weaving in these micro-moments of high intention. As you continue on in your day, notice how that high quality of intention spills over into other activities and transforms your overall sense of wellbeing. When we achieve a goal, there is an initial wave of relief. We attribute that relief to getting what it is we strove for, but truly that relief is simply because the striving has come to an end: momentarily, anyway. Striving is a habitual behavior, and if not kept in check, it will negate any possibility of experiencing enduring fulfillment. Striving at its core is a form of discontent. We look around our lives and decide something else is needed in order for our lives to be complete. This can be a time of ripe discovery in our lives if we recognize it as such, but far too often it is a missed opportunity. This silent epidemic of “hitting top” is a rapidly growing issue in First World countries, and persistent striving is just one of the symptoms. Due to its complex and varied nature, this issue of “hitting top” has only recently come to light as a new field of study. Because of this, there are too few advocates available to raise awareness and guide the afflicted masses out of that barren darkness. To make matters more serious, because we live in such a richly diverse universe, it can take us far into retirement to arrive at that point of desolation. Along the way, we misattribute our waning zest for life to the aging process, and entirely miss the opportunity to take life to the next level. There is a solution. With guided self-inquiry provided by someone who has successfully transcended that desolate void, we can discover the golden thread woven throughout our life experiences, transform our habitual thought process, break through that vapid plateau, and take life to the next level. While there is a remote possibility of achieving these results through personal self-inquiry, doing so can take years or even decades, and by then we don’t have the time or energy to explore that next level of experience. Hiring an expert in the field gets us on track and up to speed quickly, allowing us the most possible time to fully explore both our inherent and acquired wealth in meaningful and inspired ways. Want to learn more? Shoot me an email. I welcome the opportunity to hear your thoughts and questions on this most serious, and potentially transformational, experience of “hitting top”. There is a certain thought process that was necessary in order to get us where we are today. That thought process served us well to a point, but inherent in that thought process were unseen limitations. Eventually we reach a plateau where those limitations are persistently front and center in certain areas of our lives. As much as we try, we are unable to transcend those struggles, effectively limiting our experience of enduring fulfillment. To take life to the next level, we need a different lens through which we view and interpret our life experiences. Self-help solutions are often explored for this reason, and may provide a marginal and brief reprieve from the persistent angst that undermines our capacity to thrive, but following someone else’s “recipe for success” will never lead us to our own. In this way, a “different” lens is not enough to break through vapid plateaus: it must also be original to us. Original insight into our life experiences becomes possible through sincere self-inquiry. Sincere guided self-inquiry from someone who has successfully bridged that gap accelerates that process. Guided self-inquiry get us off the bench and back onto the playing field, allowing us the most time to explore and engage our new found vision before the game as we know it comes to an end. If you find you are struggling more than you are comfortable with, and you have not been able to make any genuine and lasting change in your life, consider seeking out a mentor skilled in the art of original insight. Even just a few conversations are often enough to transform our thought process, empowering us to take life to the next level. Things aren’t always going to go as planned. Things are certainly not always going to go as we like or want. That doesn’t have to be a bad thing. From our limited perspective, it’s not always easy to see how a seemingly “negative” situation may in fact be exactly the thing we need most. Our personal biases often blind us to countless opportunities to get where we most want to go. The good news is that most any situation can be leveraged in our favor if we just learn to trust the process. Trust requires us to set aside our own ideas for what should happen, allowing us to stay open to all possibilities. My suggestion: The next time you are faced with a “less than favorable” situation, use that as your cue to practice mindfulness. As you begin to feel agitated, notice one breath consciously. Allow for the possibility that there is more going on than meets the eye. Accept that the trial may be here to serve your highest interest. Get curious: How might this inconvenience be a bridge to where you are ultimately trying to get to? Trust, combined with curiosity, has the power to transform any obstacle into an accomplice helping you take life to the next level. What if, from time to time, we engaged our chores and activities as if they were the most important thing we could be doing? What if we gave everything we are to those activities? How might that intention set the stage for us to give ourselves most fully in other areas of our lives? What might our experience of life be if we engaged the mundane activities of our everyday lives as an opportunity to practice surrender, acceptance, and gratitude? Not as something we “have” to do, but as something we “get” to do? Change that arises entirely in response to unhappiness doesn’t cure the unhappiness. At most, changing our situation staves unhappiness off for a while, but we will certainly face it again. My suggestion: face that unhappiness now and acknowledge your role in creating it. The choices we make contain many unseen aspects, and some of those aspects will be “less than ideal”. When we choose a particular action, we choose even those aspects we had no way of accounting for. When we take responsibility for the choices we made that led to an experience of unhappiness, we short circuit unhappiness. Now any changes we make arise from a sense of wholeness rather than lack. And while those changes may still contain “less than ideal” aspects, those unfavorable aspects do not interfere with our capacity to also experience the fulfillment woven throughout every experience. Only when we understand that we can never make a fully informed decision can we stop trying to create fulfillment and start experiencing the fulfillment that is already here. Only then can we choose wisely, knowing that there will be parts of our choice that will challenge us to know ourselves most deeply and embracing that challenge sight unseen. This insight is part 2 of 10 in the series "Be"
We tend to feel uncomfortable when we don’t have ready solutions for obstacles that arise. In an effort to escape the discomfort, we may latch on to the first solution we come up with even if there is still time to consider alternatives. These moments of indecision are ideal for engaging mindfulness. Bringing awareness and acceptance to an experience of discomfort is far more empowering than employing brute force tactics to escape or avoid the discomfort. Rather than rushing prematurely towards a solution, be patient. Notice one breath consciously. Set a time for resolution and don’t decide anything until then. When we learn to be comfortable being uncomfortable, opportunities arise that transform our experience of life from one of uncerrtainty to one of adventure. This extra time allows for genius solutions to arise: solutions that are more fully informed, and that deepen and accelerate our experience of meaningful success. Our bodies as a whole pick up far more information from a situation than we can account for intellectually. Over thinking a situation cuts us off from our inherent wisdom. Mindful acceptance of “what is” boosts our intuitive capacity allowing for an integral response. In this way, we are able to make a more fully informed decision when we suspend our compulsion to over think situations and allow the moment to inform us. Before you choose a course of action, notice one breath consciously. Consider whether a decision even has to be made in that moment. Remember that there is no one ultimate truth that applies to every situation, and that every decision holds an experience of discovery and first-hand learning. Once you choose something, follow through. This is where we deepen our integral alignment. Whatever it is you agree to do, do it. Even if it doesn’t work out as well as you’d imagined, there will be a wealth of learning that comes from the process of keeping your word. Enduring fulfillment will continue to elude those who live their lives based largely on learned principles. That’s not to say that fulfillment is found by breaking rules, it simply means that each fresh experience provides us the opportunity to set aside logic and discover what is most valuable in that moment. In this process, our values stand revealed. They are no longer strictly aligned with ideals of what is “right and just”, but include input from the situation at hand. It is a process of discovery that places first-hand experience above second-hand logic, and establishes an entirely different allegiance to our values. Instead of choosing a particular action because it connects us to established precepts, we choose it because it connects us to who we are within the context of that situation. This provides us with an expanded sense of self, and so leads us to an expanded experience of wholeness. That experience of wholeness is where fulfillment resides. Once core values are identified, be sure to hold those values loosely. Like a birch tree in a driving storm, allow them to bend when necessary based on the situation at hand. Holding too tightly onto an ideal is exactly the mode of thinking that mindfulness attempts to transcend. Identify the value, then look to see how and if it shows up in each situation.